A sense of humour goes a long way in defining a game’s identity. 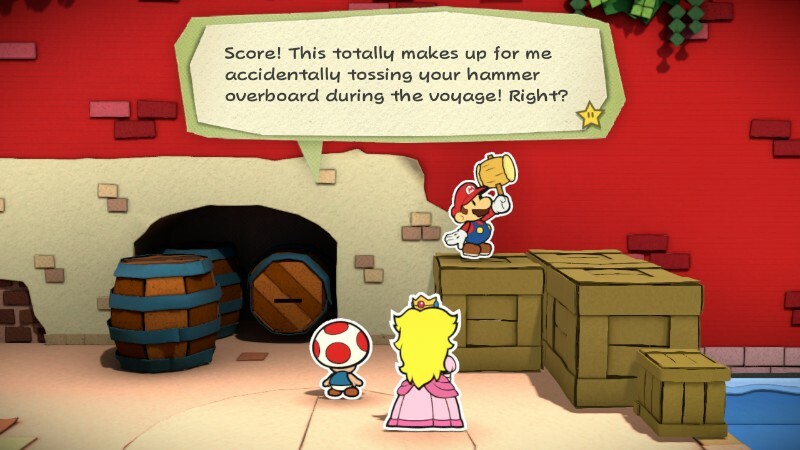 In Paper Mario Color Splash, jokes paint new life into every scenario and character interaction, upping the ante of peculiar situations tenfold. 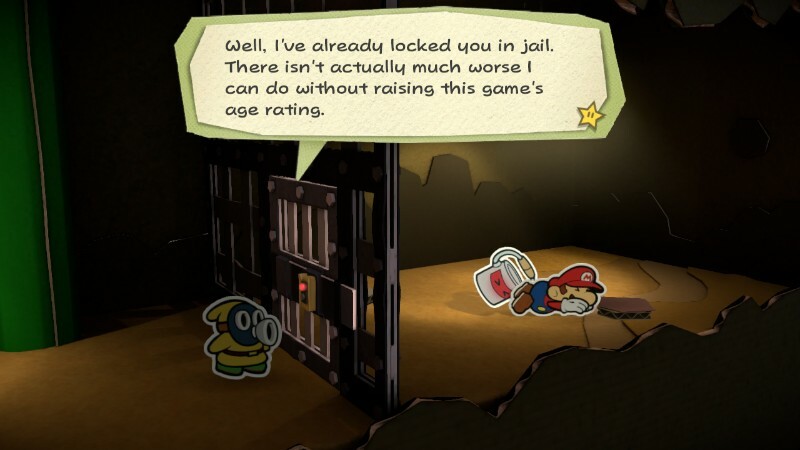 The Paper Mario series has historically emphasised comedy, but the latest entry cranks that dial up to 11 with a barrage of gags in unprecedented situations. 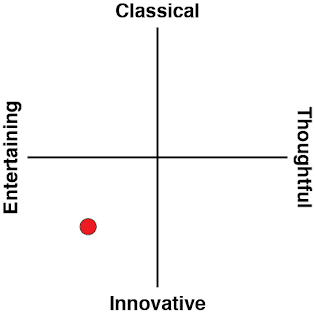 The result is a thoroughly charismatic experience that flaunts far more personality than its immediate predecessor. 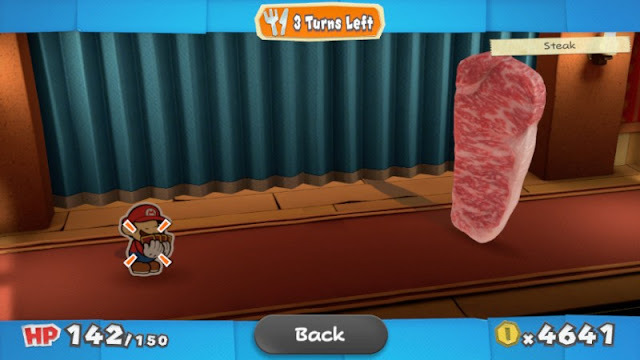 2012’s Paper Mario Sticker Star featured one of the more sterile interpretations of the Mushroom Kingdom ever conceived and, although Color Splash doesn’t fully flesh out its gratuitous Toad residents into actual characters, it represents serious stylistic development for a franchise undergoing an identity crisis. This is a louder, more vivacious spin on the last game’s formula that prioritises the here-and-now gags over any sort of deep, overarching experience. It goes out of its way to establish a central motif in the form of painting and that theme extends further than “here are some stickers, go use them”. This weaves a respectable action-adventure game where banter is the exquisite flavouring generously sprinkled to bring the quest to life. As a result, Mario’s latest outing is wholly endearing from the get-go. It’s so victorious in masking its shortcomings that some of the key faults take hours to truly sink in. The actual story beneath the gags is as paper-thin as the characters, but this is by design. Mario and Peach head to Prism Island upon receiving a strange letter in the mail, where they promptly discover the island is in shambles. Mario promptly befriends an anthropomorphic paint bucket and the obligatory star-shaped MacGuffin hunt follows. Because a certain Koopa overlord is not identified as the culprit, though, there’s this initial sense of mystery. Having an incarnation of Princess Peach with a slightly spunkier persona hanging around creates a very fresh atmosphere. Sadly, these outstanding traits are promptly thrown to the wolves in favour of the tired damsel in distress trope, but to give a backhanded compliment, it’s the probably most ambitious and involved Mario plot Nintendo has attempted as of late. Of course, the relentless comedy steps in to elevate this prototypical Mario plot. This is a game where every common grunt drops condescending one-liners on Mario as he selects an attack in battle. I lost count around 20 gags during the game's introductory sequence alone and the subsequent levels never let up. While no sense of humour is going to automatically resonate with all audiences (what with the subjective nature of comedy), Color Splash has such wit, variety, and quantity in its scriptwriting that I couldn’t help but grin during otherwise menial exchanges. The wandering townsfolk aren’t pointless information dispensers as is the case with many NPCs; spouting irreverent babble is their very raison d'être here. In addition to the expected puns, slapstick, and farce, Nintendo’s localisation staff has made some rather bold script tweaks. I can’t say I anticipated commentary on gun control or risqué references to jailbird behaviour in the family-friendly Mario universe, but I’m not about to complain about Nintendo letting its writers run hog wild for once. As Color Splash is the sequel to Paper Mario Sticker Star, it’s worth noting that much of that titles’s underlying systems remain intact. That title proved to be a controversial one amongst fans as it stripped most JRPG elements from the first two games in exchange for player discovery and resource management. Mario could not rely on traditional jump and hammer attacks; he had to gather disposable stickers (now cards in this title) that would fade after one use. 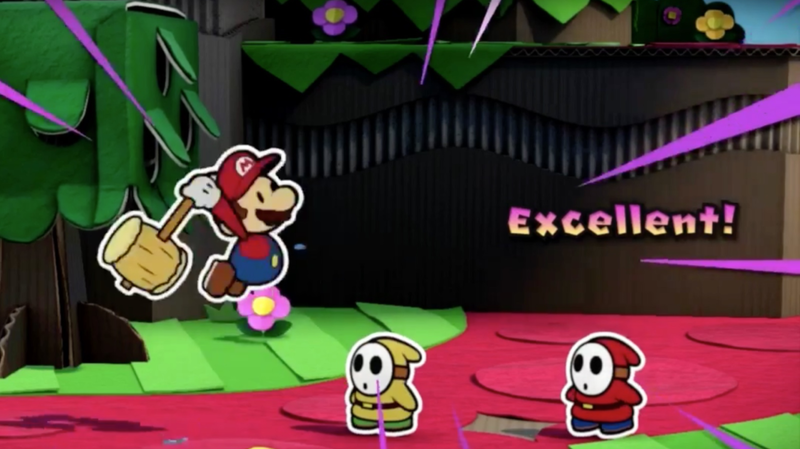 It’s silly to crucify Sticker Star’s sequel on the basis that it isn’t the original Paper Mario, though, so let’s instead evaluate how this new game compares and addresses the existing shortcomings. For starters, exploration is markedly more pleasing here. As I mentioned earlier, Sticker Star had woefully stock backdrops but this sequel takes pleasure in genuinely surprising the player. Early stages start out as inspired renditions of established settings like grasslands, caves, and beaches before getting into less stale themes like theatres, energy plants, and cafés. Atmosphere is delivered in spades and region-specific gags not otherwise possible unfold. 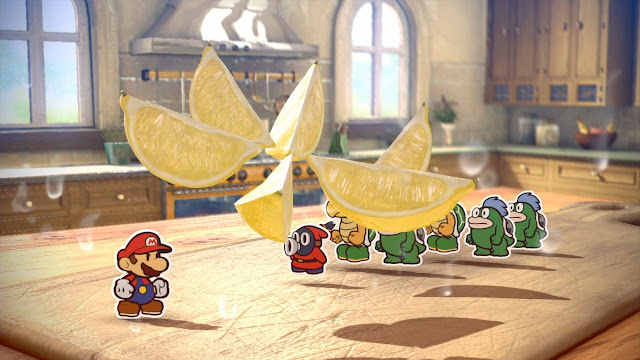 You can even take the word “unfold” literally in some cases; enemies actually break the fourth wall by weaponising the game’s paper art style and unrolling it in Mario’s direction. Such instances can lead to scripted sequences where Mario can die quickly or instantly outside of battle. Unfortunately, these require the player to immediately pick up on the rules and can potentially result in a cheap game over without warning. If you happen to lack omnipotence, tough luck - you get the privilege of seeing that main menu screen several times. In lieu of storytelling, these kinds of action set pieces are what define Color Splash. The game almost always delivers inventive little quirks to affirm the fresher settings. Rather than employ a seamlessly interconnected world, the developers have opted for almost self-contained levels that are more connected through the characters and items present there. 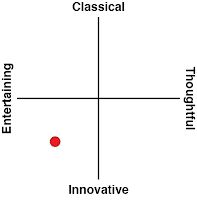 This means every level can have its own ambitious theme. There are certainly times when you’ll need to backtrack, but the world map provides a snappy way of doing so. Color Splash is a bit like an over the top episodic anime that has progression but emphasises instant gratification. As you might surmise from the title and promotional art, Color Splash also introduces a mechanic unseen in any previous title: painting. Puzzles require the player to paint objects by whacking them with Mario’s trusty hammer. This breathes life into them at the expense of Mario’s paint supply. 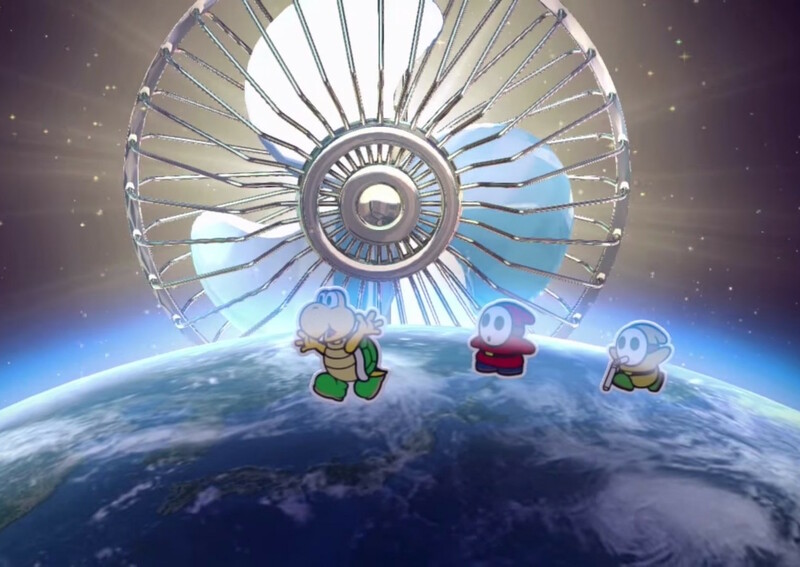 It’s reminiscent of Super Mario Sunshine's F.L.U.D.D. in that you’re cleaning someone else’s mess and have to recharge your "fuel". In this game, though, there’s an emphasis on restoring colour in completely optional locations as well. Your clear rate for any given level is even displayed on the world map; the game really wants Mario to take his time saving the land. So, is this a worthwhile addition to the series? Hammering every white space in sight just to scratch that completionist itch doesn’t exactly speak to my sensibilities. There’s a sense of frustration in hunting down obtusely hidden white spots that practically camouflage in the areas with light colour palettes. You have no real agency over what colour gets filled in since the process is automated, so I see it as the means to an end. As a one-off gimmick, though, there is absolutely some appeal. Especially with a younger crowd, it could easily be interpreted as the offspring of an inviting 3D colouring book and a massive treasure hunt. The paint meter used for the overworld even ties in with the battles, but we’ll dive into those later. Perhaps of greater importance is how Color Splash now approaches puzzle solving. The previous game would frequently subject Mario to nonsensical conundrums that employed artificial difficulty. While backtracking and juggling multiple levels at once is still important at times, the solutions here feel organic and rational by comparison. Which “Thing” (cards that are functionally similar to key items for getting past scripted roadblocks) you need to use at any given time is either spelled out, hinted at, or can be deduced via logic. You’re not likely to miss out on collecting mandatory items because they’re placed in sound locations and you don’t need to juggle tons at a time. The bad news is that Nintendo and Intelligent Systems addressed some core issues with the game's predecessor using bandage solutions. In between all the chatter, you are supposed to have a jolly time by collecting items and adventuring through various environments. This behaviour is incentivised by hiding cards (which are needed for combat), coins, and blank spots that need to be painted by Mario’s hammer at every corner. That setup is fine and dandy in theory, but someone determined that players couldn’t be trusted to juggle resources like cards and coins themselves. I’m not exaggerating when I say, without intentionally grinding, I obtained 9999 coins in a couple hours of this 30+ hour adventure. I then found myself compulsively throwing around currency just so what I kept acquiring wouldn’t go to waste. The integrity of the setup collapses because the player is drowned in an ocean of superfluous wealth. This lack of confidence in the player influences other components of the game adversely as well. Because respectable pre-painted cards sell for mere pocket change and are readily available elsewhere, the once-clever concept of painting cards to power them up loses meaning outside of limited circumstances. 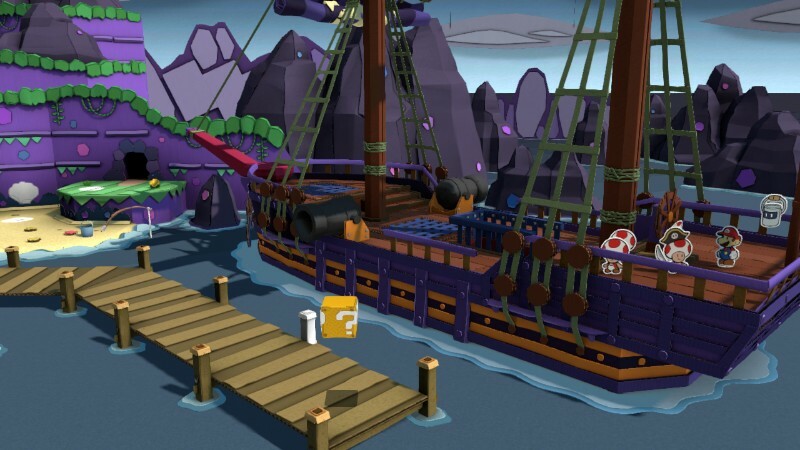 The player can then take advantage of that liberty to maximise paint usage on the blank areas hidden in each level. In terms of being overprotective, the game is clingier than its questionable forefather. At first glance, the updated battle system looks superior to Sticker Star’s. That game initially limited the number of attacks the player could store and execute to a low sum and bizarrely penalised players for experimenting with a diverse set of weaponry. It would sneakily mandate particular types over the others without warning, so you’d have to retreat to the shop or scrounge up new ones. Color Splash is less restrictive; you have a 99 card limit from the outset, which is terrific for both covering the bases and hoarding extra cards you love. There’s also a system where touching a card with the stylus allows you to paint it and thus deal more damage to enemies. That’s about where the upgrade ends. You still cannot target enemies, which makes fighting multiple foes that require specific cards types simply wasteful to your inventory. You can still end up in unwinnable circumstances occasionally too, particularly when the recurring Kamek character converts all of the player’s cards into a single type that isn’t effective on all enemy types. There are several other frustrating limitations here, but the biggest step backwards is the speed of battle. Mundane skirmishes last longer than necessary relative to the complexity. Combat feels weighted and clunky with far too many button presses and time spent wading through cards versus actually stomping on foes, which does take its time as well. Even if you opt for the advanced settings to limit how the game breaks picking a card into many superfluous phases, you still need to pointlessly flick the card across the screen. There’s also absolutely no need to have repeat cards laid out individually instead of stacked and numbered, especially given that cards of all things should pile nicely. For a game that values the heat of the moment over all else, this messy setup severely hampers the pacing. Thus, while the lethargic battles can be wearisome, I mostly take issue with how they clash with the game’s own design sensibilities. The way this new Paper Mario’s story and comedy are presented fails to mesh with the JRPG, a slower paced genre, yet it employs that setup and gains little for its troubles. In Color Splash's free-form contexts, battles have become vestigial at best and vampiric filler at worst, which ultimately inhibits the instant gratification the game is otherwise designed around. This is not a game that asks players to formulate strategies; it just makes menial tasks laborious. 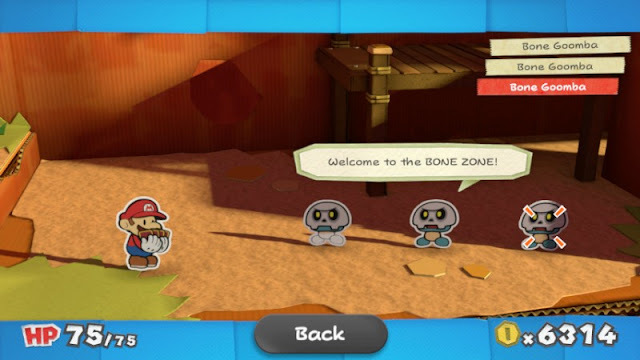 The game tries to invoke a sense of overarching progression for Mario over the course of his journey so that combat evolves accordingly, but this plan falls flat on its face. The idea is that you’ll want to increase the paint meter so Mario can amplify the power of his blank cards, so enemies drop experience-like hammers that increase your paint reserves. For a while, this works as motivation. Very quickly, however, you reach a level where paint no longer matters because you can get pre-painted cards for nothing and painting the overworld is optional. It doesn’t help that the levels themselves feature plenty of locations to stock up on paint anyhow. Meanwhile, the growth of Mario’s HP and damage output stem from story progression, not player agency. That’s right – practically speaking, choosing to fight more slows down the ability to fight better. This only breeds disaster when it comes time for boss battles. Logic dictates that, given the vast array of card combinations, you'd engage in intense turn-based shenanigans. You know, apply buffs and debuffs, learn enemy patterns, maybe use specific attacks catered to that enemy. However, Color Splash offers little in terms of leeway and in fact punishes experimentation like a scornful parent. The bulk of major skirmishes are slight variations of the following: 1) use a couple throwaway attacks to trigger an in-battle event 2) use the “Thing” card the game tells you to 3) finish with a couple more weak attacks. If you don’t happen to have the correct Thing card, you’re essentially forfeiting from the outset and become saddled with unenviable task of backtracking for it. Take Larry Koopa for instance, who will shout something to the effect of "I'm bored. Thanks for playing, loser!" and stomp you until you die. Strategy and creativity are too often banished from the equation, limiting the practical use of all these wonderfully diverse cards. The incomplete combat stifles the entire experience and reduces an upbeat, enjoyable game to a slog at times. I cannot stress this enough. It's a shame, then, that the game dumps even more enemies on your plate than ever. Had the game adopted a system similar to Super Paper Mario where enemies were dealt with in the levels themselves, it would reduce the padding and accentuate the game's vision as a comedy. Let’s recap Color Splash’s gameplay: once you hit a threshold early on, only compulsive completionists need to fight enemies and collect resources, which are some of the most time consuming elements in the mix. What you’re left with is a charming script, fairly standard puzzle solving, and a new-age colouring book. This is why I opened the review praising the game’s script above all else. For all Color Splash’s attempts to salvage lackluster mechanics, their shallow nature endures like a cockroach. There are thoroughly inventive elements hidden in there, yes, but it shouldn’t have to be that way. I firmly believe that a turn-based battle system revolving purely around disposable items can work, it just needs methodical execution. If there’s a silver lining, it’s the game’s presentation. Thanks to attention to detail and Wii U’s beefier hardware, this one wins the award for most aesthetically pleasing game in the Paper Mario series. In a franchise named after its art style rather than story or gameplay elements, that’s quite a boon. The music compositions are similarly on point, constantly referencing classic Mario songs but reinventing them to suit the stirring locales Mario finds himself in. Perhaps because of these lavish production values, even the shoddy battles aren’t always devoid of entertainment. There’s this intangible novelty to the gimmick sequences and the card system that, for all my criticisms, I can’t deny. Paper Mario: Color Splash is an endlessly charming, cutesy journey that represents a greater achievement for the art directors and script writers than Intelligent Systems as a whole. It’s a shame that such a talented studio opted only to tweak the flawed Sticker Star and, as a result, dull and unbalanced gameplay often holds back this whimsical romp. As one of the final Wii U titles, though, it’s certifiably hilarious and might just warrant a second look.